One of the World's Most Beautiful National Parks! This relaxed, guided walk through perhaps the most famous—and some say most beautiful—of Costa Rica’s national parks lasts around 2.5 to 3 hours. During this informative hike, your guide will tell you all about the area’s history and ecosystem and will help you spot many of the animals you can find in this stunning part of the country. Afterwards, you can opt to spend the rest of the day at one of the beaches inside the park. You will meet your local, bilingual nature guide at the park entrance, located just 10-15 minutes from most Manuel Antonio hotels. You’ll then set off on the trails. As you wander in the jungle, be sure to ask about the endangered squirrel monkeys, making a comeback thanks to reforestation and habitat protection projects, and now common to see in the area. Manuel Antonio National Park is the smallest national park in Costa Rica at 683 hectares of rainforest and beaches. 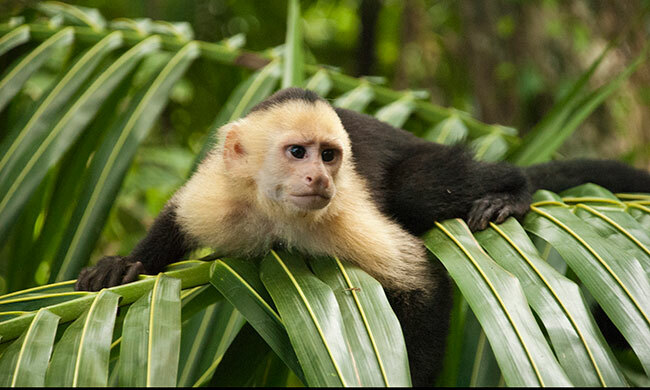 With over 100 mammals to be found and 184 species of birds, this is a great excursion for anyone looking to experience the abundance of wildlife that is found in Costa Rica. In 2011, Manuel Antonio was even listed by Forbes to be among the world’s 12 most beautiful national parks and is a must for anyone staying in Manuel Antonio! Note: park is closed on Mondays. Your tour includes: Park entrance, snacks, beverages, transportation, bilingual guide with binoculars. What to bring: Camera, t-shirt, shorts, tennis shoes, insect repellent, sunscreen, swimsuit/towel/change of clothes (optional). *Please note: stated tour price is for Manuel Antonio area. Tour is available at an additional cost from Jaco area. Inquire for more details.